My Braised Beef Short Ribs With Winter Vegetables Over Cheesy Polenta is a dish I love serving to family and friends. There are a few steps in making this recipe but it’s so worth it. A lot of complex flavors and textures are what make this dish so delicious! It’s important when making a dish like this that you get all the prep done in advance. Rub Poblano peppers with olive oil, place on a rimmed baking sheet pan, roast on all sides until they develop a beautifully charred skin on the outside, about 30 minutes, times may vary slightly. Remove from the oven, place in a heat-safe bowl and cover with plastic wrap. This method traps the steam and allows for easy removal of the skin. From there, slice the top of the poblano and remove the stems and seeds. In a large mixing bowl add the all-purpose flour, Kosher salt, and fresh ground black pepper, whisk to combine. Add the short ribs in batches to the seasoned flour. Shake off the excess flour and transfer the short ribs to a rimmed baking sheet pan until all the short ribs are coated. Place 6-quart Dutch oven over medium heat. Add 2 tablespoons of oil, and heat until it is almost smoking. Working in batches (2 tablespoons of oil per batch), add the seasoned floured beef short ribs to the hot oil. Cook ribs until browned on both sides. Remove the ribs from the pot and transfer to a rimmed baking sheet pan. Set aside. 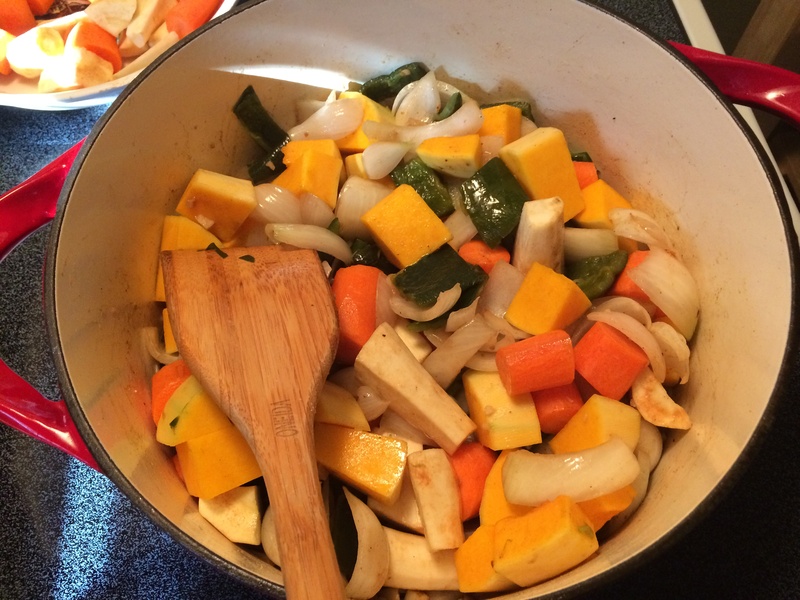 Add onions, carrots, parsnips, butternut squash, and roasted poblano peppers to oil in the Dutch oven. Cook over medium heat, stirring occasionally (using a wooden spoon), until vegetables are softened and golden, about 10 minutes. Add 1 cup of the Cabernet, stir with a wooden spoon until all the browned bits have been scraped from the bottom of the pot, and the pot is clean. 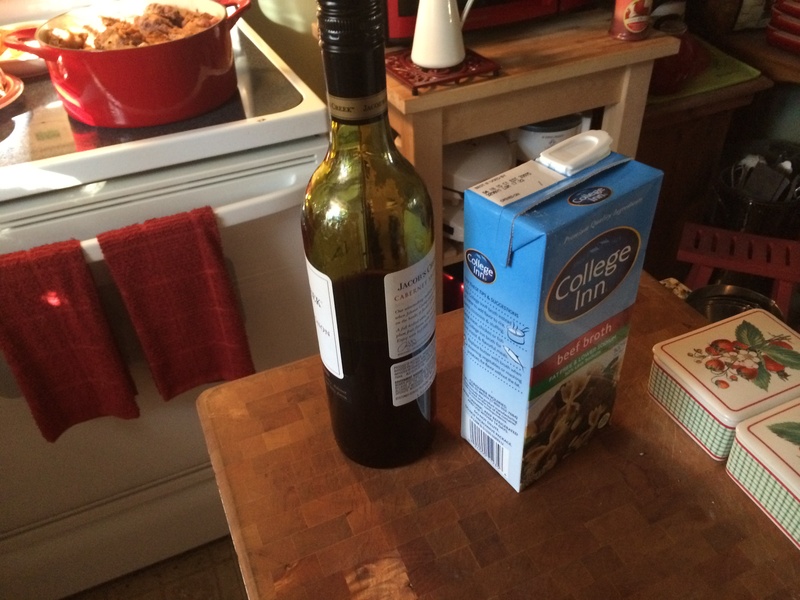 Add the remaining cup of Cabernet and reduce by half. Add the minced garlic, unsalted beef broth, and herbs. 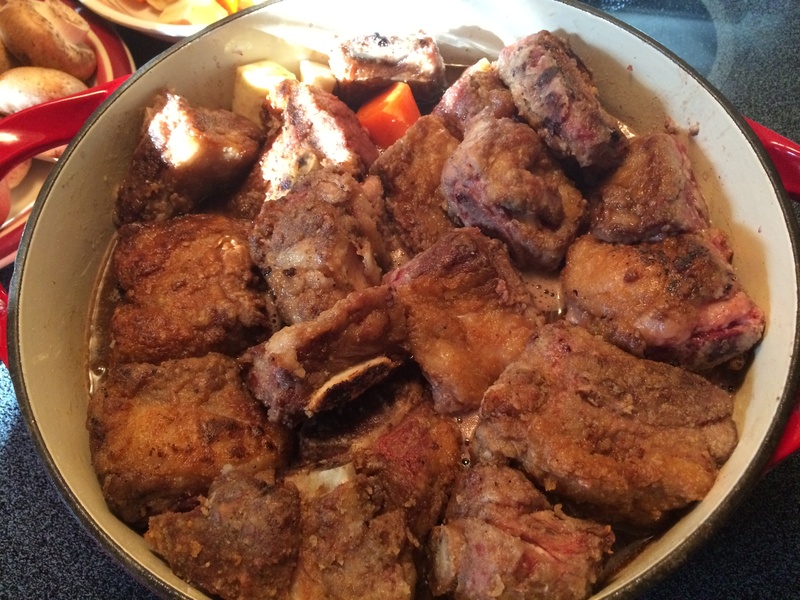 Return browned ribs to the Dutch oven. Bring the liquid to a simmer over medium-high heat. Cover the pot, and place it in the oven. Cook for 3 hours until short ribs are very tender. After the short ribs have been cooking for 2 hours 15 minutes carefully remove the pot from the oven. 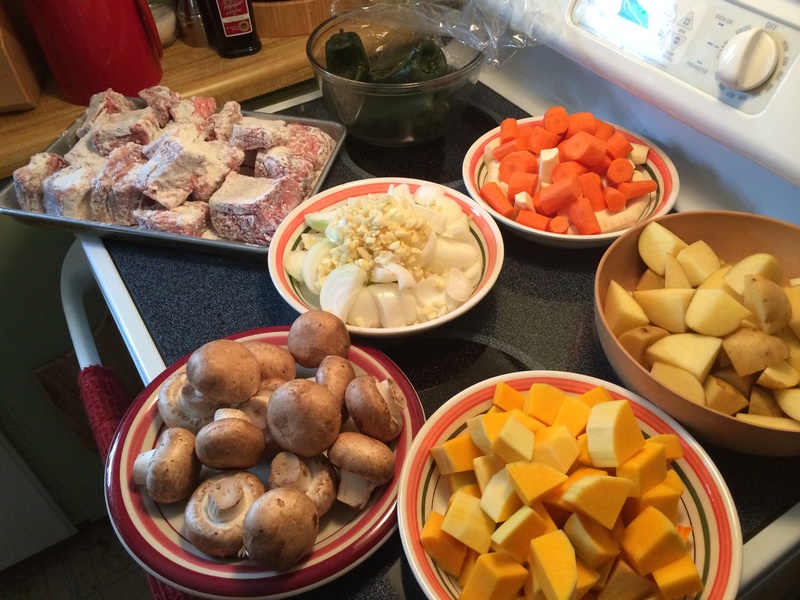 Remove the lid and add the diced potatoes and whole mushrooms. Replace the lid and place back into the oven for the remainder of the time, 45 minutes. Transfer the pot from the oven to the top of the stove. Remove the short ribs from the pot. Ladle as much fat off the top of the sauce as possible. Take two ladles of the vegetables from the bottom of the pot and transfer to a food processor. Pulse a couple of time until the vegetables are purèed. Add the purèed vegetable back into the pot, stir to combine. Set the heat to the lowest setting, stirring occasionally. 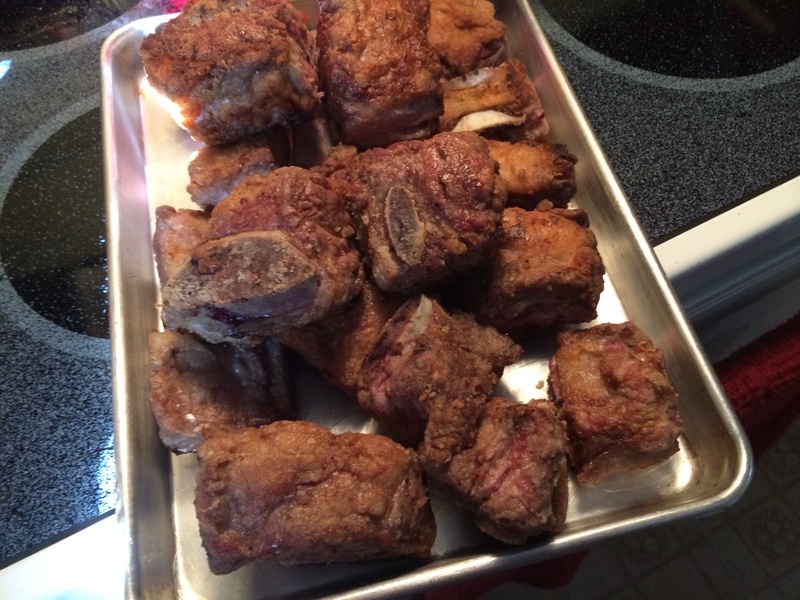 As soon as the short ribs are cool enough to handle, remove the meat from the bones. Using two forks, shred into small pieces. Return the shredded meat to the pot, stir to combine. Turn the heat to off, place the lid and keep warm. In a large pot over medium-high heat, bring half and half, unsalted chicken broth, and salt to a boil. Add the polenta in a slow stream while whisking constantly. Lower the heat to medium-low and cook, stirring with the whisk, until polenta thickens and slow bubbles erupt about 5 minutes. Remove the pot from the stove, switch to a wooden spoon, stir in butter, pepper, and cheese. Keep warm until serving. To Serve: Ladle the cheesy Polenta in the bottom of a serving bowl. Ladle the Braised Beef Short Ribs With Winter Vegetables Over Cheesy Polenta. Serve hot.